The words “Gran Turismo” never seemed more apt. For those of you who missed out on signing up for the 2011 Pipeburn Meat Burn & Burn (it’s this weekend, guys!) or for the rest of you overseas types, we’ve been sending out regular updates on the day to all those who put up their hands. In the last one we mentioned that we’d be riding on dirt for a small part of the day. Cue about 27 frantic questions from some of the attendees sweating bullets about riding their bikes off-road. 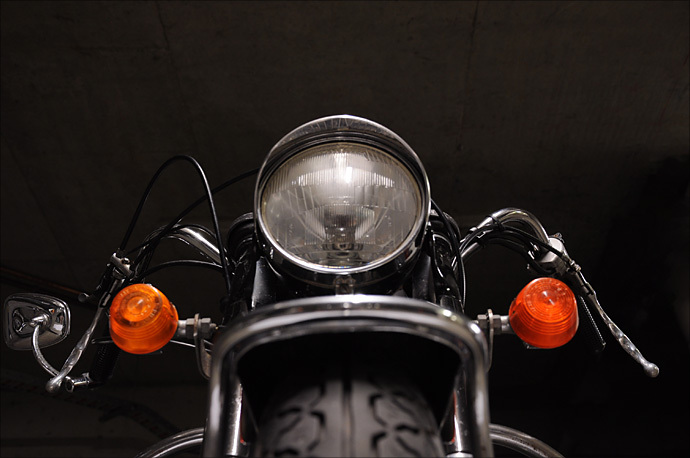 I duly diffused the panic (hello Mike if you’re reading) and went on my merry way, which on this particular day involved shooting the beautiful Guzzi you see before you. Imagine then the internal chuckles that I enjoyed when I asked the owner of this 250kg (550 lbs) beauty, the super cool and most friendly David Ottesen, how she handled. “Beautifully. I even take her off-road; she’s great fun to ride on the dirt.” Damn straight, brother. Dave Ottesen. I am an Aircraft Mechanic (I detect a trend here – Andrew), I work on Helicopter gas turbine engines. 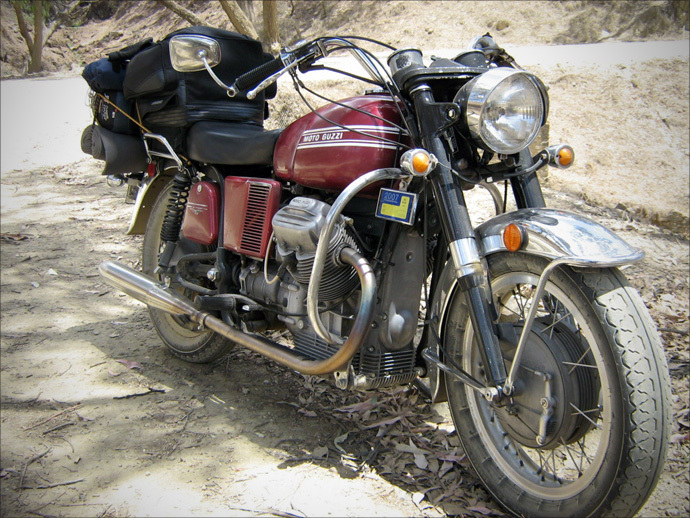 I live in the Wollindilly Shire about 90ks south of Sydney, great country roads and really suited to the Guzzi. Can you tell us a little bit about her? 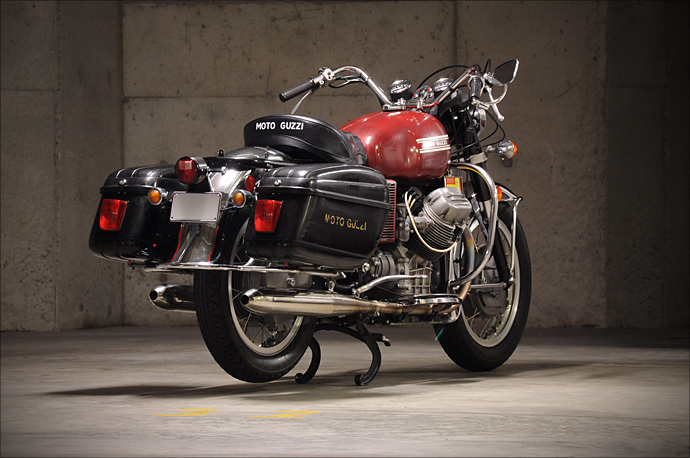 She’s a 1973 Moto Guzzi GT 850/5 speed (similar to the American Eldorado). I’ve had her (I looked up the sale receipt) 18 years now. A good mate had a 750 Ambassador (looks the same as the GT but is a 750/4 speed) and I always like the look and sound of it so when I found this one in the local classifieds (an old fashion newspaper type back then!) down in Victoria, we headed down in his old Bedford van to pick it up, I think it was an 16 hour round trip in one day! but well worth it. Since I’ve had the bike I’ve rebuilt the motor, changed the clutch for the later one (stronger output shaft splines), and in the gearbox I’ve replaced a selector spring and seals and also some final drive seals. 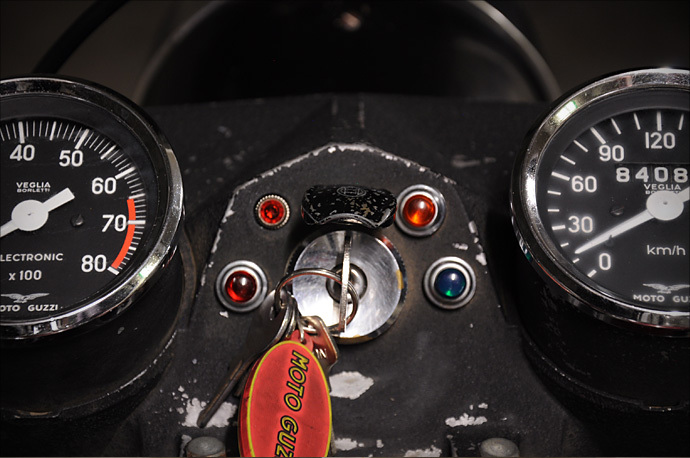 When I got the bike it had footpegs (see bottom image), full length seat and smaller handle bars so I changed to running boards, single saddle and American style handle bars, I got these from Moto V, a Sydney based guy who does loop frame Guzzi spares. You entered her into the Deus v-twin show. how was that? I really only went to have a look at the show and didn’t intend to go in it but the guys at Deus said “go on, put it in”, so I did. I’m glad I did, I had a great day talking to all the guys there, looking at so many different bikes, something for everyone. The people from Deus always put on a great day. 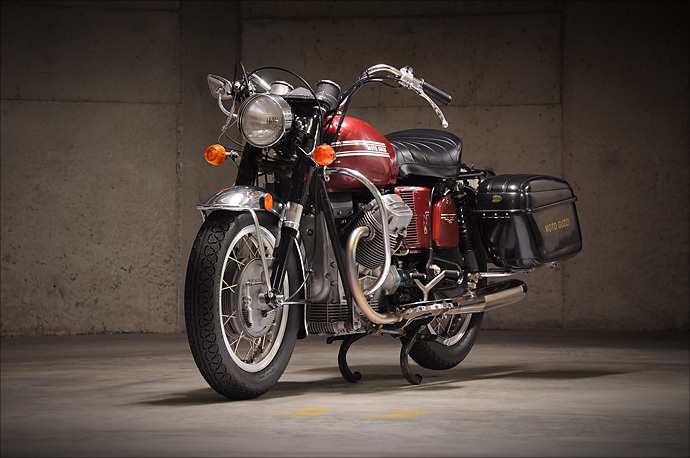 I love riding her, great riding position for those big fast sweeping corners, I do a few Guzzi rallies, the Ragged Fringe Rally in N.S.W and I did my first Spaghetti Rally last year down in Victoria. We generally do about 1500 kms in the weekend and she is perfect for it, good in the dirt as well! Ever thought of restoring or customising her? I have thought about it but not for long, the paint did look pretty good when I got her, but it’s worn over the past 18 years so we are a good match. I can’t polish it any more as it’s down to steel in some places so maybe a clear coat over the top someday when it gets too thin. 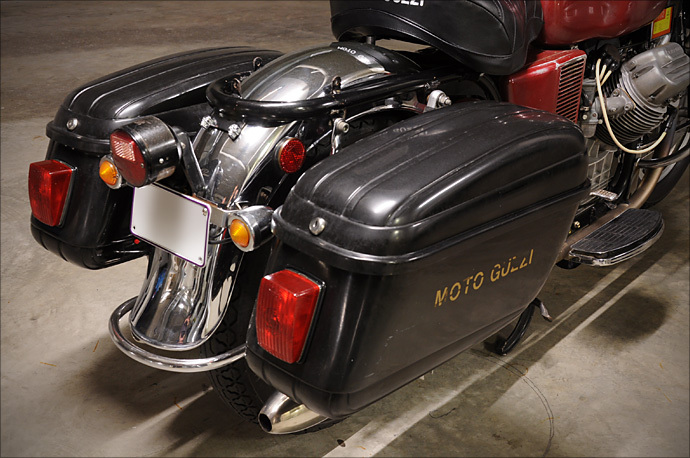 I have a Bennelli 125ss that I am restoring; it’s similar to the type they race in the Motogiro in Italy. 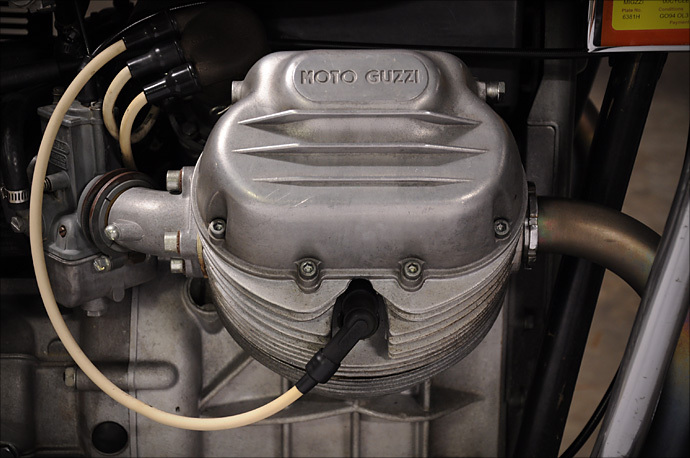 I also have a Suzuki GT 250 café style that I’m doing; I’m making the race expansion chambers from scratch for it – hopefully it should be loud. She’s on New South Wales “vintage plates” – can you describe what that means to our international and interstate readers? I’ve had the Guzzi on vintage plate now for almost two years, I joined the Classic Italian Motorcycle Association of Australia and they have a club plate scheme were you can register you 30 year old bike or older on Historical plates. It costs $50 a year for rego and I pay $83 for comprehensive insurance. You are restricted to club rides/rallies but there are lots, you can also suggest rides that you might like to go on; not bad for under $150 a year. A good bunch of guys at CIMAA, they love their Italian bikes. 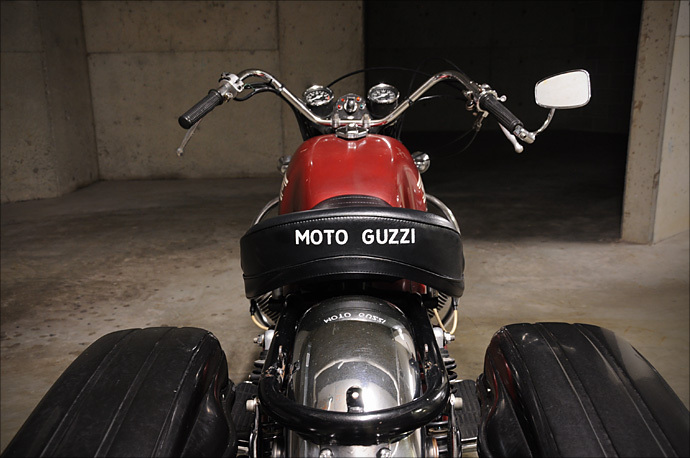 I’d like a Moto Guzzi 1100 Griso. I’ve had a go on mates and they look good, handle well, and sound fantastic with the aftermarket pipe. 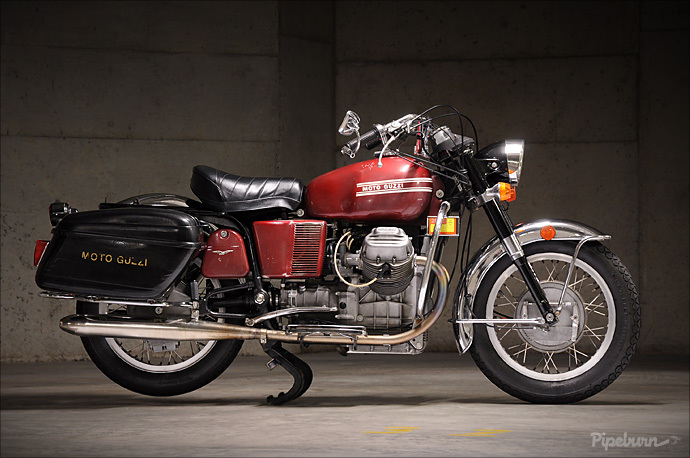 But if I had lots of cash I’d grab a Moto Guzzi V7 Sport. My workshop (or “shed” in Aussie parlance) is pretty basic, 2 good work benches, wire buffs, polishing buffs, welder and hand tools. It’s hot in the summer and bloody cold in the winter, I love it. See – a little dirt never hurt anyone. Man up, people!